We take you through 2013’s hottest summer tech gadgets, plus we take a trip back in time! As aired on Cityline, Tuesday, July 9, 2013, on City. As seen in Spring 2013 edition of Walmart Live Better magazine, available FREE from your local Walmart Supercentre. For taking snapshots of your kids at the park, or sneaking a sweet pic of your tot at her first day of preschool, the camera built into your mobile phone will get the job done. But if you’re looking to boost the quality of your family photos, a “real” camera is the way to go. With dozens of different kinds of cameras on the market today, though, it’s easy to get lost in the photography aisles. So here are tips for finding the perfect camera to fit your lifestyle, budget and picture-taking needs. Do you want to keep a small camera in your handbag so it’s at the ready for your kids’ next adorable moment? Look at point-and-shoot models like the Nikon COOLPIX L610 ($208). These foolproof cameras allow you to capture higher-quality images while letting you explore your photographic creativity. If you’re a budding photographer looking for something more high-end, try out a DSLR camera like the Canon Rebel T2i ($536). This style of camera is the kind professionals use, and they are typically larger, heavier and pricier. Or does your photographic style fall somewhere in the middle? Mirrorless cameras (also called micro 4/3 cameras) offer many of the features seen in DSLRs, but they’re less expensive and more compact. Sure, taking a picture is as easy as pushing a button, but if you want quality photos you’ll be proud to display, take a quick minute to set up each shot before you snap. Where is the light coming from? You never want to take a photo with a sunny window in the background – your kids and their puppy will appear as faceless silhouettes. Instead, find natural light and use it to your advantage – place your subjects so they’re facing the light, and turn off your flash. For best results, take pictures at eye level with your subjects, rather than looking down or up at them. If you’re trying to capture snaps of your busy toddler, get down to her level, and use a tripod if you need help to keep the camera steady. With digital photography, you can take as many pictures as you want without wasting film – all you need is a good-sized memory card. Many cameras allow you to set a continuous shooting mode where you can hold down the shutter button to capture multiple images – perfect when you’re shooting hockey games or dance recitals (you can always delete any bad shots). Flip through your camera’s manual and you’ll find many modes to suit your needs. Experiment with them! 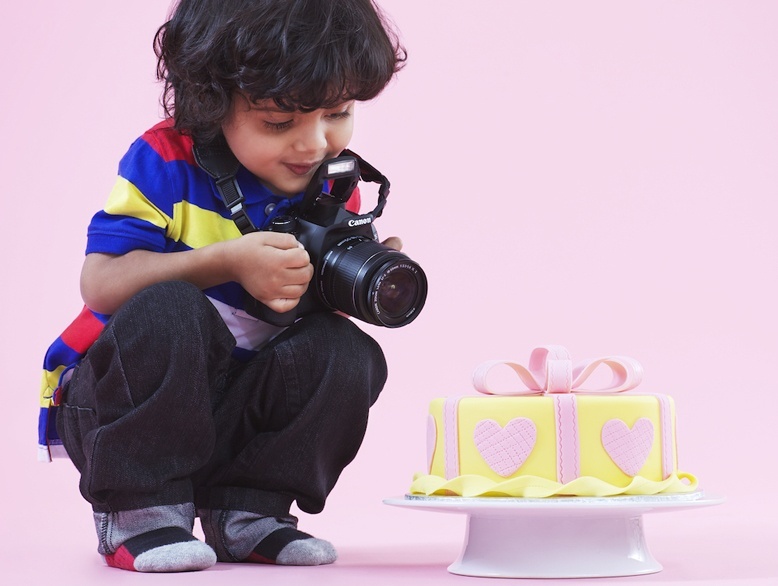 You’ve taken thousands of priceless photos on your digital camera…. Now what? You’ll probably want to upload them for safe storage, print some hard copies as keepsakes, as well as share them with friends and family on your favourite social media networks. Secure Ditigal, or SD, cards let you upload securely to the web. The 32GB Lexar High Speed SD card ($36.98) slides right into your camera’s SD memory card slots and can be programmed to connect to your Wi-Fi network. Once connected, the card will automatically set your privacy settings and send photos to your predetermined social media sites. A high-quality memory card is an easy way to minimize the chance of losing your precious photos and corrupting files. Depending on how much you plan on spending, you can purchase a variety of “class cards.” As a rule of thumb, the higher the class, the higher the quality of the memory card. If you are simply capturing photos, a low- to mid-class memory card will do. If you are also capturing hours of HD video alongside photos on a digital camera, invest in a higher-quality memory card that will allow you to record video at a much higher speed. Creating backup copies is the best way to preserve your photo memories. Walmart PhotoCentre offers secure, free storage of your digital images. So if you lose your computer, or your hard drive gets fried, your photos will still be safe. Plus, you can access your photos anytime through your mobile phone using the free app. Get in the picture, mom! Flip through your photo albums or digital files and you’ll probably notice there aren’t too many shots of you with the family – the photographer misses out on being in the picture. To put yourself in more pics, we recommend a GorillaPod by Joby ($51). It’s a tripod with flexible legs that bend around any object and adjust to any height you need, while keeping your camera steady. Set a self- timer, then jump into the picture. With Mother’s Day just around the corner, skip the box of chocolates and consider a personalized gift from the Walmart PhotoCentre that will let the moms in your life know you’re thinking about them on their special day. The best part? Many gifts (including mugs and photo canvases) can be printed in an hour. Using the Walmart Photo Prints app (available for iOS devices), you can order your favourite photos for print and pickup from the comfort of your smartphone via your Walmart PhotoCentre account – perfect if you’re looking for last-minute gift ideas. As always, you can re-watch previous episodes of CityLine on Citytv.com, or via the Citytv Video iPad/iPhone app! CityLine airs 9am/4pm EST on Citytv in Toronto. Check Citytv.com for air times in your city. The 2011 Summer Holiday season is rolling around the corner, and whether you’re headed to the beach or the cottage, you’re sure to want to capture all of those special moments with your loved ones! Below are my top three picks for cameras perfect for the outdoors! Two of them are waterproof, shockproof and dirt-proof, so you can feel free to go rock climbing, or even snorkeling with them! This camera is great as it is enclosed in a durable, waterproof and rugged design. It maintains its great looks while taking high-quality photos. Ideal for taking out on a day at the beach, or on the boat, this allows people from kids to adults to have a great time taking photos without the worry of it breaking. This camera is capable of HD video and also comes in a wide range of exciting colors (blue, orange, red, silver, white). Waterproof – A system of waterproof seals and gaskets keeps water out so you can take pictures as deep as 10 feet underwater. Shockproof – The camera has a durable body with an innovative shock-absorbing technology protects it from drops of up to 5 feet. Freezeproof – The TOUGH camera is freezeproof down to 14°F/-10°C. It is even perfect for after summer, including skiing, snowboarding, sledding and other winter fun! This camera is winterized to perform at below-freezing temperatures! This camera is ideal whether you’re out snorkeling in the Caribbean this summer, or rumbling down the ski hills this winter! No matter where you are, this multi-purpose camcorder will protect itself from all types of weather conditions; not to mention its HD capability. The camera is waterproof up to two meters and it comes equipped with video stabilization and 10x digital zoom, just so your viewers don’t become queazy! This is definitely my entry pick for the photographers who want to dive deeper into photography. This camera is what Canon calls “the REBEL on the move.” It is great for those photographers who are looking for an easy option to create that photo with a sparkle, and one that will give you stunning end results. The T3i continues the well-established tradition with a compact design that doesn’t compromise on performance. Definitely a best-seller in its category! 18.0 Megapixel CMOS (APS-C) sensor and DIGIC 4 Image Processor for high image quality and speed. ISO 100 – 6400 (expandable to 12800) for shooting from bright to dim light. Improved EOS Full HD Movie mode with manual exposure control, expanded recording [1920 x 1080 Full HD video at frame rates of 30 (29.97), 24 (23.976) and 25.0 frames per second] with new Movie Digital zoom and Video Snapshot features for enhanced movie shooting options. Vari-angle 3.0-inch Clear View LCD monitor (3:2) for shooting at high or low angles and 1,040,000-dot VGA with reflection reduction using multi coating and high-transparency materials for bright and clear viewing. 3.7 fps continuous shooting up to approximately 34 JPEGs or approximately 6 RAW. These are all great choices! If you’re headed out on summer vacation, and you’re looking for a camera that will last through many great vacations to come, you should definitely check these out! Do you have any interesting camera picks? Leave a comment below, Tweet or email me!